At Anatomy Physical Therapy (APT) we are qualified to administer Sports First Aid for accidents and injuries in the sporting environment. Our therapists are trained by the Academy of Emergency Care in Sports, a body approved by the Faculty of Sport & Medicine, Royal College of Surgeons of Ireland and Royal College of Physicians of Ireland. Our Sports First Aid Service is available to sporting clubs 7 days a week and we currently work with a number of prominent Gaelic and Rugby Football Clubs and schools in the Dublin area. Sports First Aid is similar in many ways to First Aid except that the emphasis is on potential injuries and accidents in the sporting arena. It is concerned with the emergency treatment administered to an injured/sick person before medical care arrives. The aim of Sports First Aid is to preserve life, prevent further harm or the condition worsening and to promote recovery from the injury by perhaps completing a treatment such as applying a splint to a fracture. Contact sports such as rugby, hurling and football have the potential for any number of serious injuries ranging from minor grazes to broken bones. Sports First Aid provides the initial care for the injured sports person, ensuring their comfort until medical support arrives. 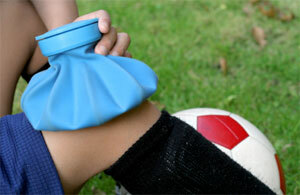 What to expect from Sports First Aid at Anatomy Physical Therapy. At APT we offer a professional and flexible Sports First Aid Service 7 days a week. Our utmost concern is that of the patient’s welfare and comfort throughout the administering of First Aid. In addition to our Therapists being fully qualified to administer Sports First Aid, they are also qualified Physical Therapists. This is particularly relevant and important where injuries may require treatment of soft tissue or more serious first aid treatment such as a fracture. APT Therapists are qualified and experienced to deliver both roles in the sporting environment. We have been trained in basic life support techniques including CPR and are capable of dealing with any issues arising regarding choking in an unconscious casualty. APT Therapists are proficient in managing and treating wounds and bleeding and have the necessary skills to manage and treat fractures, sprains, strains, dislocations and common medical emergencies such as burns, scalds and bumps. Our aim is to bring the patient’s treatment further than just a simple first aid approach thus helping speed recover. 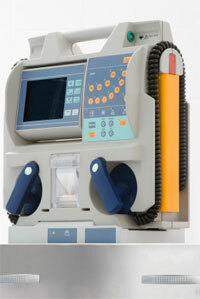 Our Therapists have been trained to use a defibrillator. A defibrillator is a machine used to shock the victim's heart and restore the heart's normal rhythmic patterns. The early use of a defibrillator can dramatically increase the chance of survival. The APT therapist administering Sports First Aid will keep the patient comfortable until specialist medical attention is available. The benefits of Sports First Aid with Anatomy Physical Therapy. At APT we offer a professional and flexible Sports First Aid Service 7 days a week. Our therapists are certified by the Academy of Emergency Care in Sports, a reputable body approved by the Royal College of Surgeons in Ireland and the Royal College of Physicians in Ireland. Our Therapists are qualified in both Physical Therapy and Sports First Aid which has many benefits to the injured player or athlete. The patient will receive a better quality of care as a professional therapist is present to assess the injury, administer First Aid and, where required, deliver initial treatment to the patient at the point of accident. This immediate care may result in a player being fit enough to continue in play or at a minimum it will accelerate the recovery process, prevent further harm and avoid having to transport the patient elsewhere to receive similar care. In an extreme case, speedy assessment and judgement may even make the difference between a life or death situation. Where the Sports First Aid Professional is also the Team Therapist, advantages also accrue in terms of the Team Therapist understanding each player’s pathology and so when an accident arises they are able to examine the injury first hand and, based on their player knowledge, immediately implement a course of action to kick-start the recovery process and return the injured player to their game as soon as possible. This continuity of care greatly contributes to improved follow-on care. Knowing the team are in qualified, safe hands enables the Coach to concentrate on the game or competition, confident in knowledge that any injuries that may occur will receive the best possible professional attention. Ensuring the best of care for players demonstrates the clubs commitment to the basic principles of player welfare i.e. preserve life, prevent further harm and promote recovery. APT Therapists are active sports people and understand the desire and need of the player or athlete to return to competition as soon as possible. We are committed to the welfare of the athletes and teams we support and strive to return each individual to their competitive sport as fit and as soon as is practical.